Google has been testing a new version of its homepage that hides the navigation links and the search buttons until you move your cursor. The page appears to load faster, it's less cluttered and better suited for searching, but it might confuse some users. 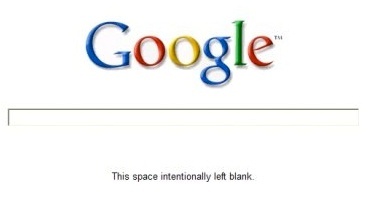 Search Engine Roundtable noticed an experiment that displayed "This space intentionally left blank" below the search box. Most likely, it's an attempt to explain that the page is already loaded. Google's idea is interesting, but I don't think that it's really necessary to remove the navigational elements from a homepage that's already simple. "The fade in thing is pointless, and I really would like my search buttons back. Yes, I can indeed hit return, but when I'm copying and pasting text into the search box using my mouse, I want to then move my mouse to click a button, and not have to put the mouse down to use the keyboard to hit return before going back to mousing. Small thing but *really* frustrating. Why take the buttons away? Some people like to click them, other people like to hit return, I tend to do both depending on whether I'm copy/pasting with the mouse or typing text in with the keyboard." "Google's main page will no longer by my default browser homepage if they don't get rid of the fade. I hate it. Half the time I want to go to Gmail, and I have to move the mouse cursor over the window and wait a few seconds before I can click to go to Gmail. This is a loss of functionality in my mind. I love minimalism, but this just makes things worse." "After considering for a week - I think I like it. The novelty is gone, but the simplicity of the interface ensures that I'm not distracted before I type my search term. I actually often use the box, type my query and press enter without ever moving my mouse. The interface is seamless and does everything I want it to do - getting me to results as quickly as possible. If I do need any other Google feature, they are still available just as quickly (perhaps the fade in on mouse movement should be just a touch faster). I appreciate this might not be a feature for the mainstream - but I would encourage you to at least keep it as an option. It embodies everything that keeps me using Google, simplicity with functionality." Don't turn into Apple, Google. Buttons are there for a reason! I prefer the older home page. Change-for-changes' sake is foolish. And as someone who has used Chrome from the day it was released, and knows that Firefox and IE both have search boxes that don't require loading the search engine home page just to then be able to type in a search phrase, my first thought was, "People STILL search from Google's home page? Really? Why?" I was going to type what Jim typed, but he already did. I guess I can understand some lay-users still using the google home page. But if you care how it looks, I can't believe you're still using it. That sounds like the dumbest idea ever. @Jim Why do people still search from Google's home page? To see the doodles, of course. I admit I was confused for a second. It would be nice as an option to turn on and off. If you want customer loyalty, give customizable options for stuff like this. I don't really care now that I know but what really annoys me is that since there has been no warning about this I have wasted a lot of time searching for reasons for my screen taking so long to be populated. It was only by fluke that I noticed that nothing happened until I moved my mouse and then I was able to put something more meaningful into the search box, which took me to this page. If Google are going to make any changes to a screen that so many people use so often they could at least have the courtesy to tell us. @Anonymous about Google and lack of courtesy - I think you hit it right on the head. At one time Google was the hip, new company and could do things like make their page into a puzzle for us to figure out. But now, unfortunately for them, they have become the world's first cyber-utility. And utility companies don't get to be hip, nor puzzling. They just have to BE THERE, reliable, steady and really sort of stodgy. Because you're right, the number of people who use and rely on Google is a VERY LARGE number, and you don't just screw with those people's time on a whim. Unless you're too big and too arrogant to care. 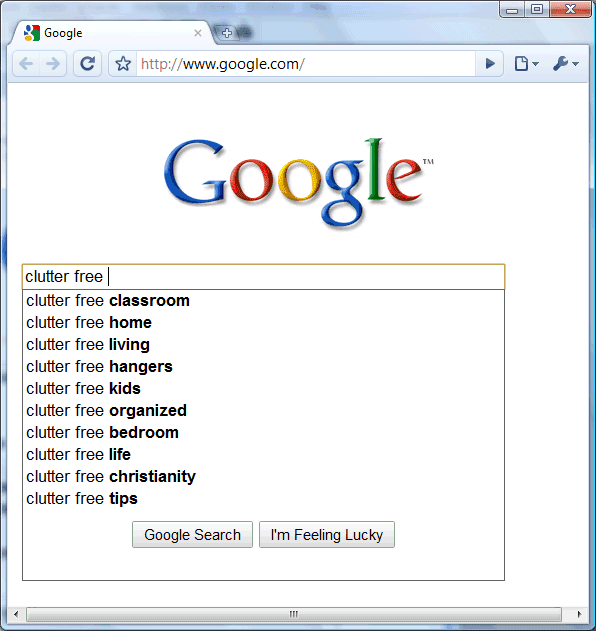 Google should have a "No Clutter" page that shows only the search box and a link to a "Customize Your Clutter" page. Some people like me want absolutely zero clutter. Others, who like the hyperclutter of a Yahoo home page would have the option of creating a custom clutter scene that would make their socks roll up and down. If Google wants brand loyalty, that's all they have to do. And, oh yes, keep making the search engine better. Andy Grove is right - it's best to hear footsteps - because they ARE gaining on you. If you don't move your mouse, Google's homepage only shows a search box and two buttons.